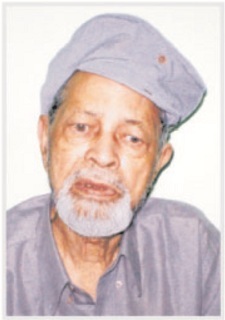 Izhar Asar (1929-2011) was an Urdu Science Fiction author from India. At the time of the partition of India he moved from what later became Pakistan to India. It was a rare move since most of the movement of Muslims was in the other direction. Starting from 1950s onwards he wrote a number of Science Fiction novels. In 1953 he wrote a short story Mashinon ki Baghaawat (Rebellion of the machines) that imagines a scenario where machines rebel against humans because some humans tell them to do immoral actions. His first science fiction novel Aadhi Zindagi was published in 1955. La-shareek (the non-participant) was his collection of Science Fiction short stories. In the 50s or 60s he also wrote a poem entitled Dinosaur.